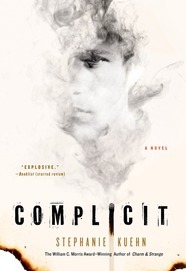 Home » Reviews and Publicity » Stars for COMPLICIT! We loooooved the Morris Award-winning CHARM & STRANGE by Stephanie Kuehn and now she's made us fans for life with her second book, COMPLICIT. Two years ago, sixteen-year-old Jamie Henry breathed a sigh of relief when a judge sentenced his older sister Crazy Cate Henry to juvenile detention for burning down their neighbor’s fancy horse barn. The whole town did. But now Cate's out and she’s coming back for Jamie. Because more than anything, Cate Henry needs her little brother to know this one simple truth: She’s not the crazy one and never has been. Are you hooked yet? Don't miss Stephanie Kuehn's interview with YALSA's The Hub on COMPLICIT and CHARM & STRANGE.